A medium sized vessel of standard rating. Built in 1984 and refit in 2005. Carries a maximum of 1370 passengers in 625 cabins, 416 of which have ocean views. 4 cabins are accessible to disabled passengers. All cabins are well equipped and the deluxe cabins have a bathtub. There are two show lounges featuring a weekly guest artist. Other features include a cinema, library and casino. Poor poor poor!!! First time cruise & naively thought the vibration the whole time we were on the boat was part of it. Lost seven nights sleep, exhausting with so much to see. No other complaints but how can they allow this to continue, apparently they have known about this issue for 10 years +. We had our best ever transit through Gatwick with Cathy in wheelchair and Dariusdave limping alongside. Our only disappointment was that we would not be flying a “Dreamliner” to Dubai. Seats in the old Boeing felt cramped but night flight uneventful. Transit through Dubai was good, a decent pusher looked after Cathy and eventually our two cases appeared. We were helped to our coach and Dariusdave enjoyed our journey from airport to Cruise terminal and Celebration. This would be our third Celebration cruise, pre-boarding procedures were smoothly accomplished. We were greeted as old friends as we boarded and escorted to our “accessibility cabin” 103. Well Celebration is an ageing French lady with all the idiosyncrasies and temperaments one might expect. We selected this cruise as a first trip to The Gulf hoping the sun would help our arthritic joints. Our cheerful cabin boy guided us to cabin 103 and despite a few sharp turns and narrow corridors we encountered our first Celebration idiosyncrasy, the cabin door was too narrow for Cathy’s chariot. So our response was simple, for the remainder of the cruise, Cathy would stand open the door Dariusdave would fold the wheelchair then enter. Cabin 103 was fascinating. The bathroom door was wide enough to allow the wheelchair to enter. But to create a decent wet room the floor had been raised hence there was a steep “ramp” from bedroom to bathroom. Fortunately Cathy could walk up and down this ramp. Otherwise the bathroom was good possessing many grab rails, a loo that vacuum flushed, a fine basin and a shower with a seat and again plenty of grab rails. All worked well. Our bed was comfortable, had room underneath for our cases. There was plenty of wardrobe space with quality hangers. There were chests of drawers a writing desk and flat screen television, kettle with tea and coffee making facility. Dariusdave found a 13 square pin plug for his sleep apnoea machine. We managed to move around and store Cathy’s chariot. Yes there was a safe and we paid knowing our insurance would cover its contents cameras, I-pad, passports, phones etc. As Celebration returners we were used to the vibration particularly in port where Dariusdave has previously mentioned that the rubber mountings for the generators had perished years ago. Times have changed aboard Celebration since our previous visit. A humorous Spanish waiter was stationed near the lifts with poster, table and tickets flogging a meal deal. Celebration was, for a fee, offering Hot Stone Steaks (on deck back of Lido Restaurant), Curry House (Kora La) and a Fine dine at Mistral’s. Well Dariusdave is succour for bargain dines so we bought the package. Except for the last breakfast and our three dinner packages we wined, dined and breakfasted at The Meridian Restaurant. Seasoned third world travellers we enjoyed every meal. 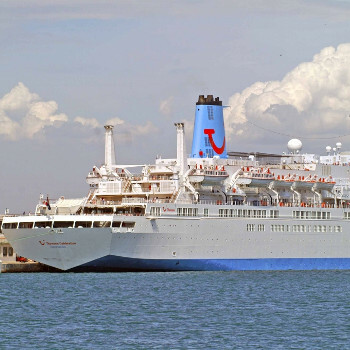 We had plenty of choices and compared to Thomson’s Spirit the service was always “Ship shape and Bristol fashion”. Rather like “Are You Being Served” the crew’s rank was reflected in their uniform, but we were delighted the way a pair of young Officers (one male, one female) always welcomed us and prepared a table where Cathy could sit with dignity. Celebration’s Meridian Restaurant crew worked as a team, there was a spirit of helping guests creating a relaxed atmosphere conducive to friendly conversation. Evenings we regularly dined with a Lancastrian couple retired publicans who had a cricketing son and a Yorkshire couple. The Yorkshire couple proud of their arranged marriage one Sikh, one Hindu, the retired teacher knew our daughter’s school. Diversity amongst pensioners was one of many enjoyable aspects to this cruise. It has to be said we really missed Maris & Thomas Intense singing on deck 9 Horizons Bar and before Captain’s Welcome evening speech. We always loved Maris & Thomas who were friendly, professional singers who entertained bantering with their adoring audience. Regret Thomson need to send out the talent scouts as replacements on Cities of Gold Cruise were like watching a coarse rugby team when used to being entertained a Premiership team. However our dining friends kept inviting us to join them in the Broadway Show Lounge. Now Dariusdave a regular to London’s West End (Motown my birthday treat in April) has been a tad critical of shows on previous cruises. Cities of Gold Jan 2017 was a great improvement, Cathy loved these shows even when watching from her chariot which sometimes offered a restricted view. Yes we were entertained so let’s say a big thank you to the Show Squad. We came to see The Cities Of Gold, we had booked “panoramic” trips for every port. Yet again Dariusdave’s theory that cruise ships attract first class guides was confirmed. Every trip was a delight frequently with bonus items. 12th Jan Manama Bahrain what should have been a quick photo stop turned into a guided tour of the Al Fatah Grand Mosque. Men were invited to wear a Dash, our Lady Guide dressed in Hijab was informative mentioning at least 12 times ”our creator God” and readily responded to questions. Dariusdave at the end of the tour sought explanations regarding Mary the Mother of Jesus. Our Guide detailed what Dariusdave had heard at Sultan Ahmet (Blue Mosque) Istanbul, that Mary is the most important lady on earth, more important than the guides mother or daughter that Mary is mentioned more often in The Koran than the four Gospels. Dariusdave was first given Chapter 19 from The Koran “Maryam” and later an English translation for The Koran. Our guide and other official helpers at “The Book Table” kept repeating that there were no charges in this or any other Mosque. As an Ecumenical Anglican I wish our Senior Clergy Deans and Bishops could learn from these sincere folk when imposing charges to visit or pray in English Cathedrals. Dariusdave was worried when rumour suggested that the Khasab trip would require tenders. Would Cathy be able to go ashore? Questions were put to the Thomson trip team located by The Coffee Port. Delighted to be assured that if Cathy could descend a few steps Thomson crew were proficient and experienced at transferring mobility challenged passengers to tenders. Yes they succeeded with dignity. Interesting while we were waiting Captain Krzysztof was “prowling around” very hands on making sure that all was well and safe. We felt the Khasab trip was exceptional, possibly the best. Our Egyptian Guide was most informative. We enjoyed his tales about the “smugglers” how most days 30-50 speedboats equipped with large Yamaha outboard engines speed across The Straits of Hormuz from Iran bringing livestock and Saffron, returning with electronics (flat screen t.v’s, computers, Marlborough and heaven forbid Johnnie Walker). So much for United Nations or E.U. sanctions from our coach we saw the smugglers fleet leaving Khasab a most impressive flotilla. We were amused with our Abu Dhabi trip; we passed through a “duty free” area with free Wi-Fi. It seemed most the crew were here communicating with their families and perhaps taking advantage of the posters offering free money transfers to Philippines. The highlight of this trip should have been The Gold Souk; Dariusdave was under pressure to purchase a Sapphire treat for Cathy to commemorate 45 years marriage. No luck, our Yorkshire friends (call a spade a spade) suggested on our return there was nothing they would want to be seen wearing in England. We kept mentioning to crew how much we were looking forward to re-joining Celebration in August to cruise from Newcastle to St Petersburg. Cities Of Gold was a wonderful much enjoyed cruise, most aspects were sheer delight. Sad to report Celebration this grand old French lady is doomed; the TUI accountants had already decided not to return to Cities Of Gold winter 2018. But even worse have decide, Dr Beeching style, to take this popular much loved lady out of service. Steam train Tornado puffed through Swindon bound for Cardiff St David’s day 2017. Every bridge, every safe photo position and station platforms were crowded with old steam train enthusiasts. The same people who would happily ignore a frayed carpet or worn joinery item so they could celebrate a Celebration cruise with friendly fellow passengers and cheerful crew. I treasure an official photo dated 16. 01. 2017 Abu Dhabi UAE Thomson Celebration. It shows Dariusdave pushing Cathy in her chariot both of us smiling happy as can be alongside Celebration. Sunday 22 January we retired to bed together, sadly The Grim Reaper called before sunrise Monday 23 January our 45 year marriage unexpectedly ended no more cruises or holidays. Every opportunity was taken to ensure they could make more money! Internet usage was charged at premium rates. Complain? They won't answer any complaints. Give them a wide birth, take my advice! I Wasn't expecting much after finding few positive reviews, and having travelled on bigger more modern ships. Expected to develop infections from anything and anyone. The outside cabin was a bit pokey, the bed was not the most comfortable. Doubles are smaller than adjoining two singles. The entertainment (watch out for the up and coming Ben Moss) was out of this world. I didn't expect such calibre from entertainments team. All the staff were phenomenal. The ship has been modernised and the standards are high. Days at sea were awful due to sunbeds being packed like sardines. However most days we woke at port, and left at night. I would book again without hesitation. It was a disaster from the start. We boarded the ship in Barbados, myself and my friend in her seventies, we had to board by the gang plank and climb up five flights of stairs after a 9 hour flight as all the lifts were being used for luggage. After being in a queue for nearly an hour we were checked in and given the key to our cabin. We arrived at the cabin and the cabin boy told us we could not go into the cabin as someone else was using it, we were told to go to reception. We waited in reception again in a queue. After another 30 mins were told to wait till another cabin could be found. After another wait we were told they had found us a cabin so off we went with the girl from reception. No wonder the cabin was free the noise in there was frightening, I could hear it before I got there, the girl from reception said she could not hear anything , it was the last cabin nearest to the back of the ship all I can say she must have been deaf. We stood in that cabin for about 5mins I could not believe that after having this holiday booked for 8 months this what I've had been given. We went back to reception and told the receptionist that we could not stay in that cabin. The receptionist told me to go back at 8.30 pm so I did again and was seen by the girl who was in charge of reception and told we could have the cabin that had been allocated in the first place. We had been travelling for hours and we're shattered. I can't believe people can treat you in this way, we paid full price for this cruise did not get it cheap like a lot of other people did who booked at last minute. The service in the dining room for dinner was very poor. They mixed all the wine up. The food was very poor. The food in the self service restaurant was very good and the shows were good. I will not be booking on this floating holiday camp again. If this had been my first cruise it would have been my last. I will stick to P&O or Celebrity X in future. We travelled on the Celebration in January 2015 in the Caribbean. It had a great itinerary and we loved all the ports. We booked all the trips on the ship and thoroughly enjoyed them all. They were all good value for money. We had most of our meals in the main restaurant. The meals were varied and of excellent quality. All the staff were fantastic and could not do enough for you. The theatre shows were up to Broadway standards. Overall a great holiday. Would definitely travel on her again. Just been to Croatia on the Celebration. Our first time with Thompsons. We had Cabin 002 which was a really huge room with a really huge long balcony, superb! We were right next to the Horizons bar and as long as you weren't the 'early to bed' kind of people, there was no noise to worry about apart from some late night shushing from people who may have imbibed a little more than usual! Hot water was a bit hit and miss at night but nothing to worry about. Food average, nothing special, but nothing terrible either, there is a huge variety to choose from, all are catered for. The young show team, worked really hard and were very good, the shows we saw were excellent. Some of the bars were a little squeezed like Hemingways/Horizons. Loads of sun loungers though, all around the decks so not a problem. The reception staff English needs to be improved upon, several times, what I was asking for was translated to the person dealing with me by another of their colleagues because they did not understand what I was saying. Organised trips ashore could have been better, a few were cancelled due to lack of interest but this was the first time the ship had gone to these destinations so not a lot was known by the destinations staff. The stand on ship was not manned very often, only 5pm - 7pm in the evening, I think they should have been in a more accessible place on ship with video loops of excursions showing on a loop, they might get better attendances. I spent a week on the Thomson Celebration and was really disappointed. After paying a fortune for the holiday and the upgrade to a deluxe cabin with drinks packages and tours included. We discovered our deluxe room was directly below the sports court. The noise from the sports deck was ridiculous and we got no peace what so ever when we were in the cabin. Getting ready for the poorly chosen evening shows became a chore as the constant banging from above became so loud we had to leave the room early most evenings. Only to then be woken at 7:30am the next morning by the same noise. Thomson had no control over the opening or closing times of the deck what so ever. We made our complaint early on to reception and were offered nothing what so ever. I was assured that the UK office would be notified and that was a complete lie as they have said they heard nothing of the reports and will do nothing in the way of compensation. 4 of the toilets on deck 5 were out of use on the last two days which became a real issue with passengers queueing. The quality of the food and the evening shows was so poor it was embarrassing. There was no room what so ever to move on the ship as it was so overcrowded during meal times and the sun loungers were all crammed together. I paid a lot of money for a less than budget experience. I will be sure to never book with Thomson again - that's something quite sad as I have been so loyal to Thomson for the last 10 years. I feel so let down that I have no other choice but to ensure I spread the word on what an awful experience I have had with them as a company. Having done 10 cruises and a number of them on Thomson's ships, we booked our wedding anniversary holiday on the Celebration. Having booked a deluxe cabin we eagerly followed the steward to the deck after spending over 30 minutes looking for it as it did not show on the deck plan, it was previously a staff cabin. We were shocked to see the condition of the cabin and bathroom. It was dirty with biscuits on the floor and the bathroom was smelly with the shaver socket hanging off the wall. It smelt strongly of stale cigarette smoke. We complained daily that the toilet didn't flush and on a number of days and nights we had to go down to use the reception toilets. Our cabin was next to the door to the bridge and wireless operators door, a staff area where they congregated outside our door of an evening talking and smoking. Every evening we complained when we returned to our cabin as the entire cabin smelt of smoke and as we are non-smokers it was awful. Housekeeping came every evening and sprayed the area with a strong deodoriser which made us cough. The wardrobe was next to the cabin door therefore everything hanging in there smelt too. Our entire holiday was spoilt due to the problems with cabin 051. Never again will we pay a huge supplement upgrade to Thomson's.